The Clothes Closet is a nonprofit thrift store located in South St. Paul, Minnesota. Staffed almost entirely by volunteers, and filled with donated items, this store offers a unique and fun shopping experience that won’t break the bank. Every item that is donated to the Clothes Closet is inspected by one of our dedicated volunteers to ensure it meets our high quality standards before it goes on sale. Our vast selection of gently used clothing and household items changes daily, so be sure to check back often to see what’s new. You never know what you might find! The Clothes Closet is so much more than just a thrift store, it’s also fun and easy way to give back to the community. One hundred percent of the proceeds from the store support the emergency and supportive services provided by Neighbors, Inc. That means that every dollar you spend in the store helps someone in need. 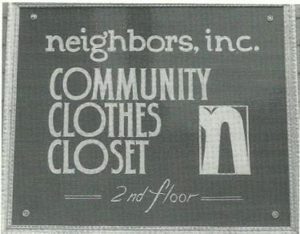 Neighbors also offers clothing vouchers to people in need of assistance. Hundreds of children and adults throughout northern Dakota County are able to get a winter coat, an outfit for a job interview or clothing for school through the voucher program. In 2016, clients with vouchers received the equivalent of almost $14,000 worth of clothing. In addition to clothing vouchers, Neighbors now also offers vouchers for household items such as blankets, dishware, lamps and much more! In January 1972, volunteers from six local faith communities came together to help their neighbors suffering from an economic crisis – the result was Neighbors, Inc. At the time, both the Swift and Armour packing companies were closing their local meat packing operations, removing 9,000 jobs from the local economy. An independent non-profit organization was formed to provide assistance to families in need. On June 1, 1972, the Neighbors, Inc. Clothes Closet officially opened its doors. It started out in a former shoe repair shop in the basement of 519 Marie Avenue. Virginia Milbert, who was on the first Neighbors Executive Committee and has been volunteering at the Clothes Closet since the very beginning, said she could still recall the smell of shoe polish that pervaded the first basement clothing store. Business was slow at first, but by the end of 1973, proceeds were up to approximately $125 a month. Over the years, the Clothes Closet continued to grow in popularity and size, and the store changed locations many times. Some locations worked out better than others. During its time in the former Union Hall building, volunteers often had to distribute buckets throughout the store to catch drops from the leaky roof on rainy days, and the long and steep set of stairs leading up to the second floor of the building at 222 North Concord left more than a few people winded. But the dedicated volunteers made it work and the Clothes Closet continued to grow and prosper thanks to their hard work. By 1988, the store was bursting at the seams and it was time to, yet again, find a new location. 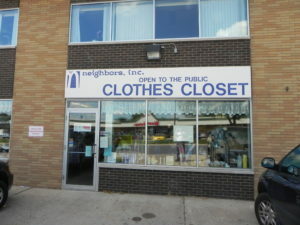 For the next 25 years the Clothes Closet called 218 13th Avenue South home. 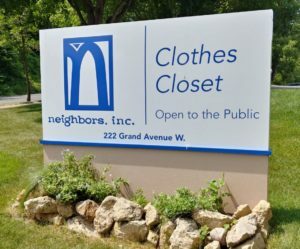 In 2011, after years of planning, Neighbors, Inc. and the Clothes Closet moved to 222 Grand Avenue West in South St. Paul where they remain to this day.